Os visitantes do Rio de Janeiro em busca de praias imaculadas e águas claras não precisam mais procurar Arraial do Cabo. Com esta excursão de um dia, você explorará a área conhecida como "Caribe brasileiro", ao mesmo tempo em que um guia cuidará do transporte e do almoço. 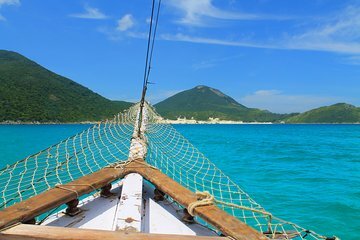 Você também aproveitará o melhor dos dois mundos, combinando um rápido passeio pela cidade com uma excursão de barco ao longo da costa e várias ilhas para nadar e mergulhar com snorkel. Not a tour for English speakers. Guide barely spoke English. The day was perfect. After an early pick-up at the hotel, we went to Arraial do Cabo it's a 2-3 hours ride depends on traffic. We stop in the morning for coffee etc not included. We had around thirty minutes at the port before going on the boat, there were some shops, food and restrooms. Then we went for a four hours cruise, we stopped 30 minutes at Praia do do Forno and Praia do Farol. Our guide Isaac was very nice and friendly as well as the cruise crew. On the boat, there were food and drinks not included, music. I would definitely recommend this tour because the landscapes were amazing.